The Only Two Canon Tripods And The Superior Alternatives You Can Get. So, you're asking about Canon Tripods. Canon has never placed a big emphasis on offering an extensive line of tripods. That's a good thing! They are better known for the long line of Canon cameras and lenses. Hey Canon, stick to cameras and lenses and focus on making them good! 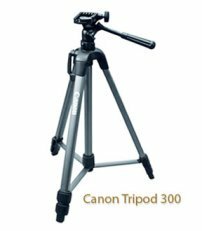 The two available models of Canon Tripods are the Canon Deluxe Tripod 300 and the Canon Deluxe 200 Tripod. Both of these models are suitable for the entire line of Canon cameras with one big exception. 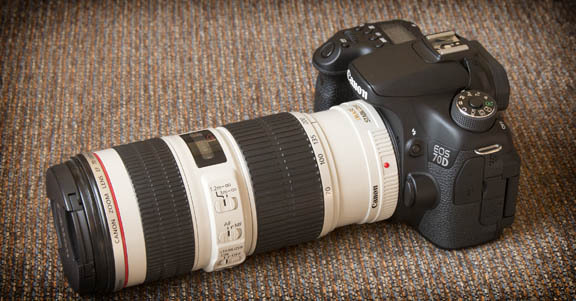 They're not sturdy enough to handle a Canon DSLR with a big lens attached. Both the Canon Deluxe 200 and the Canon Deluxe Tripod 300 use the same design. The center pole is ly attached to the legs bith 3 stabilizer bars for more stability. 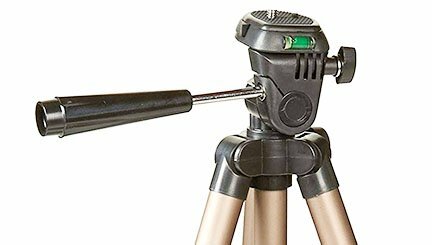 There are design differences in some tripod designs that make them more appropriate for either taking digital stills or shooting video. For most people one tripod is plenty good enough to handle both stills and video. Max Height w/extended column 59.3"
The Deluxe 300 model reminds me a lot of a few Velbon tripods I purchased from BestBuy several years ago. The braces are attached from center column to the legs with cheap rivets and do not hold up over time well at all. The attachments all broke with both of my Velbons and I had to replace the rivets by using paperclips of all things to prevent my camera from falling. It was not a good situation. Several reviewers on amazon reported the same issue with these Canon tripods. These two tripods are of average quality, made primarily of plastic, and are priced accordingly. Don't get me wrong, for $40 they are not a horrible choice. You must treat them extremely gently and do not expect them to last a lifetime. With both of the Canon tripods, the long screwdriver type of handle that's used to adjust tilt and pan is a nice feature. Small adjustments in the precise position of your camera are easy to maker. Ball heads tend to be secure and lightweight but not as easy to adjust. These two tripods are both entry-level pieces of photography equipment suitable for the beginning photographer on a budget. Usually at this price level, replacement parts are not available and not worth getting. Warranties are also extremely limited, if existent at all for cheaper, plastic tripods. I do not recommend you buy them unless you are a complete Canon loyalist and want to buy all Canon equipment. This is a good example of when it may not be a good idea to commit to a Canon camera accessory. Tripods with independently locking legs give you a lot more flexibility in where you can set your tripod up. Fierce competition among online tripod sellers has driven the price of high quality alternatives to the Canon models downward. 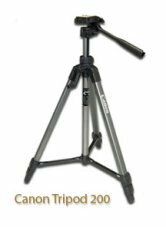 Excellent quality tripods have become very affordable. You have thousands and thousands of other choices rather than pick one of the suspect tripods made by Canon. Save yourself some time by tapping into the huge number of consumer reviewers who purchased and tried specific tripods. Search for yourself and get their opinions. 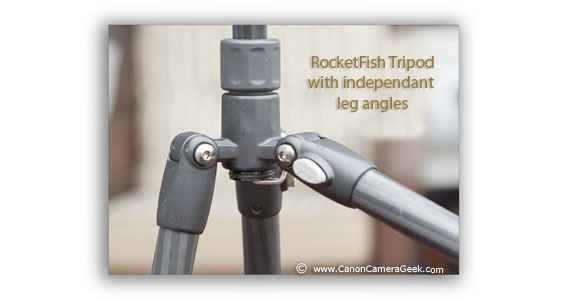 I prefer using tripods that have independently angling legs like the RocketFish Carbon Fiber tripod pictured here. This is very helpful when doing outdoor photography on uneven terrain as well as some special tight situations when doing indoor photography. This particular one, the RF-TRP-47C was only a few more dollars that the Canon tripods. It is a bit shorter, but much stronger and is also lightweight at 2.5 lbs. Each leg can be adjusted for different angles and the metal ball head has kept my Canon 5D Mark III with a 70-200mm f2.8 lens secure. Canon Tripods are not the best camera accessories that you can buy. The offerings for Canon speedlites and Canon camera lenses are more extensive and measure up better to the Canon standards of quality. Get yourself a good solid tripod by another manufacturer. It is a great addition to your collection of camera accessories including Canon Rebel Accessories. Canon's tripods are considered to be budget tripods. That's not necessarily a deal killer, but you need to know a few things before buying one. 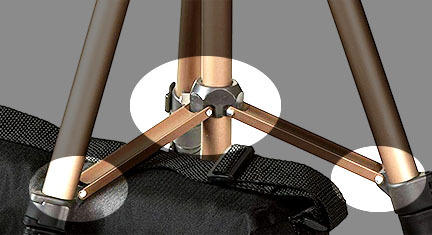 Budget tripods are often made with arms that attach from the center post to the legs. It would appear that's a good way to add stability. The issue is that over time the connections loosen and sometimes break completely. 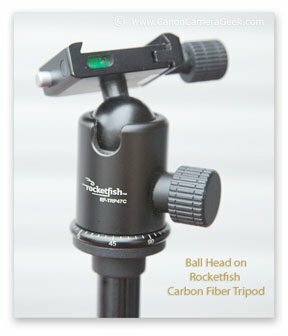 Budget tripod heads are made with plastic and are not interchangeable. Cheap tripods usually come with the traditional screwdriver type of handle. 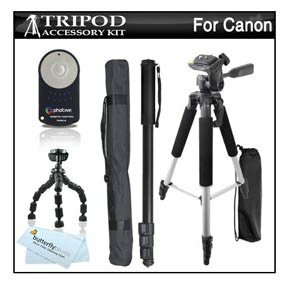 Tripod bundles can save you money, but there are two precautions that come along with them. They might not be the right mix of accessories that you really need. The quality of some of the included accessories may be low. 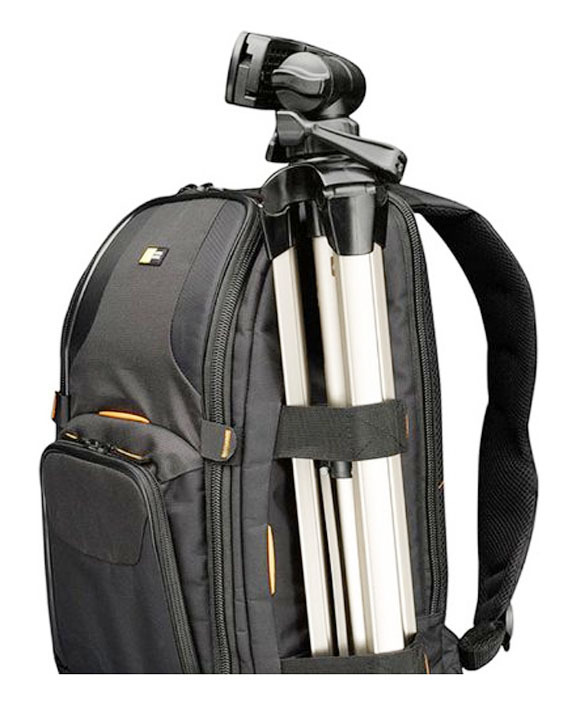 Tripods are very valuable gadgets to have, but they're even more appealing when it's easy to carry them along.